Madigan made… a tutorial to make a simple pinecone wreath. If you follow me on Pinterest, they you already can see that I love wreaths. Wreaths are an easy way to make a room festive for the holidays without taking up too much space. This week I am showing you three Christmas wreath ideas in three days. 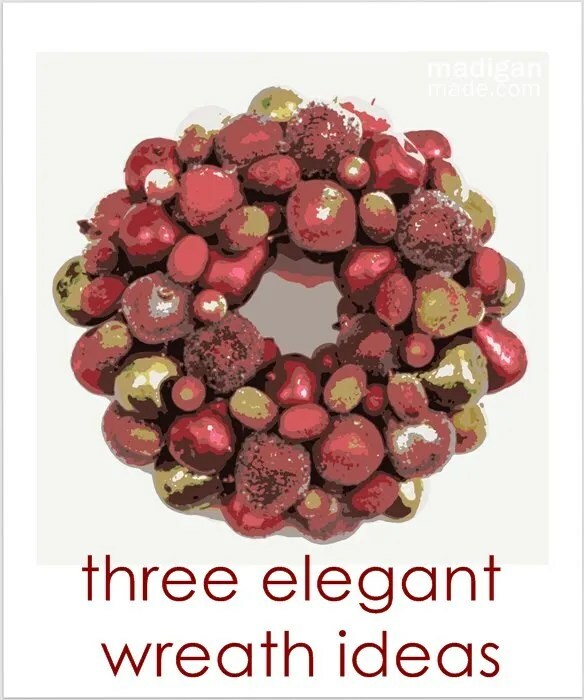 Did you catch my jeweled fruit ornament wreath yesterday? Well, today I want to show a simple and elegant wreath made from pinecones. I didn’t have to go out and buy or collect them because I already owned a bunch of gold ones! Do you remember the big bowl of gilded pinecones that I used last fall around Thanksgiving? To give the pinecones a gilded look, I brushed the outside of those pinecones with gold craft paint or dusted a few of them with gold spray paint. The metallic color made them a little more festive for the holidays. Well, I didn’t really use the pinecones much for décor this year, so I decided to recycle them into a wreath. To make this wreath, I followed the same basic steps that I used with the Christmas ornament wreath… I just substituted pinecones for the ornaments. Secure the end of your ribbon to the wreath with glue. Wrap the ribbon around the wreath to completely cover it and glue the end of the ribbon down. Add a thin, loose loop of wire around the wreath to use to hang the wreath later. Start to glue your medium size pinecones around the circumference of the wreath form. It is a little tricky to attach pinecones since their surface is not smooth. Use lots of glue at several points between the wreath and other pinecones. Glue down your larger pinecones on top of the smaller ones and the wreath form. Given their irregular shape, I recommend doing a ‘dry fit’ with your pinecones before gluing everything down. Fill in and attach smaller pinecones and gold ornaments over any big gaps in the wreath. Use the heat from your hair dryer to clean up any hot glue strings. It was a last minute addition while I was crafting, but love the little gold acorn ornaments mixed in the wreath. They add another elegant, gilded touch to the woodland look of the wreath. Don’t forget to come back here tomorrow… I’ll be sharing one more elegant DIY wreath idea! And if you missed the jeweled ornament wreath, go back and check that wreath idea out.